"My piano teacher gives me a gift that can't be wrapped. He gives me courage when I try a new piece of music on the piano and get some notes wrong. He gives me confidence to do better next time. He helps me keep a steady beat and play new notes. He gives me confidence so I can improve on my pieces of music. That is why courage is the special gift my piano teacher gives to me". Graduated! 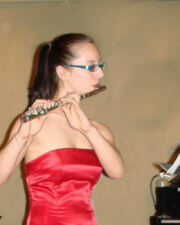 Student Darien Morgan was accepted at the Boston Flute Academy to get world-class exposure. She practices 1-3 hours a day most days. 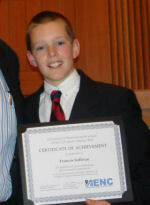 Student Francis is one of four of my students to win MENC composition contest sponsored by UMass Lowell Chapter. Jim is honored to have many worthy and highly talented students. Four piano students were nurtured into winning the state's MENC Composition Festival Award, and another to First Chair in the symphonic orchestra, another is 2nd chair. 8 students performed at the Topsfield Summer Concert on the Common over several years. Several have made albums of their own creations, one a full hour solo TV show - the list goes on. Give students freedom, encouragement, and knowledge - you never know what may happen! At our recent celebration of students "Getting Better" it was a true talent show and variety show! Exciting, memorable, a "glow" as one in the audience reported! One parent new to the annual event said "It was really a concert in itself"
Jim has dedicated himself to developing individuals in and through their musical studies - a proven passion and ability. He does his homework to make sure each student gets what is needed. His schedule now is quite full, with students Monday through Thursday, special scheduling Fridays or Saturday morning, beginners through adults. Fall 2014. Try group classes and collaborate as players and singers!